This recipe teams Scottish salmon with creamy polenta, flavoured with a strong Cheddar, such as Arran Scottish Cheddar or Mull of Kintyre Vintage Cheddar, both available from the Cheese Service Counter. Preheat the oven to 200°C, gas mark 6. Reserving 8 small herb sprigs for the garnish, strip the remaining herb leaves from the stems and finely chop. Mix in a bowl with the lemon zest and season with salt and freshly ground black pepper. Wash the salmon fillets and pat dry. Place them skin side down on a baking sheet lined with foil and baking parchment. Sprinkle the herb mixture over the top and roast for 10-12 minutes until the flesh is opaque and just flaky. Meanwhile, bring 1.5 litres water to the boil in a large pan, pour in the polenta and beat vigorously with a wooden spoon for a minute or so until smooth and evenly blended. Allow to rest for 3 minutes. Stir in the grated cheese and season. 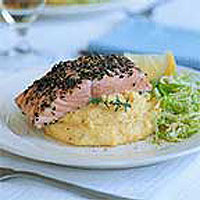 Serve the warm polenta topped with the salmon, garnished with lemon wedges and the reserved herb sprigs. Accompany it with the winter cabbage and leek stir-fry.